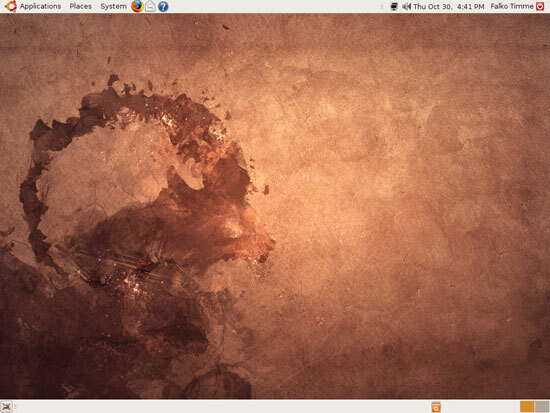 Today the new Ubuntu 8.10 (Intrepid Ibex) has been released. 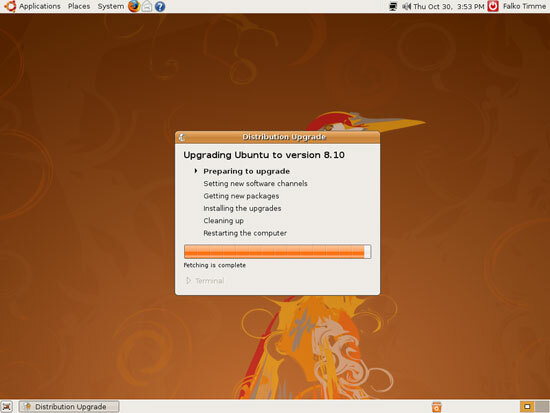 This guide shows how you can upgrade your Ubuntu 8.04 desktop and server installations to Ubuntu 8.10.
installed. 376 packages are going to be upgraded. 21 packages are going to be removed. 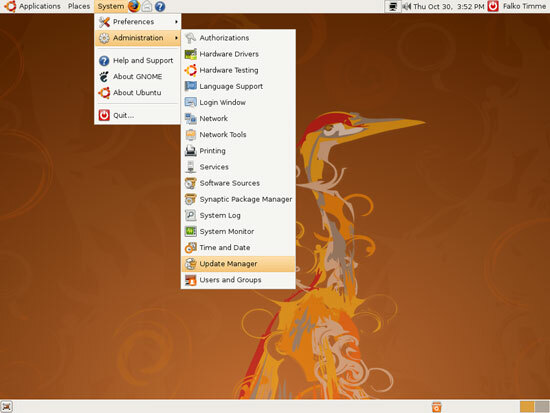 After the reboot, your server is running Ubuntu 8.10. Thank you. I couldn't figure out how to get from 8.04 to 8.10. 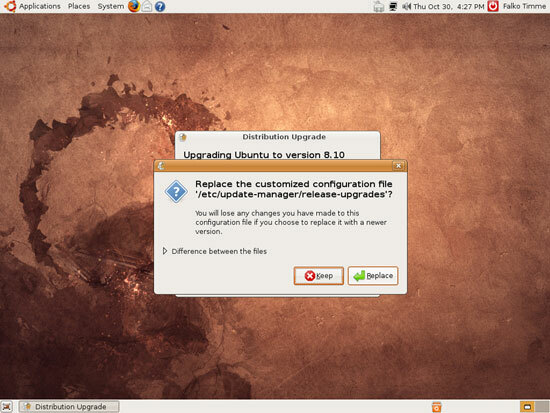 Using vi to edit /etc/update-manager/release-upgrades did the trick. One million thanks for a happy Friday night! that's far too simple. Ubuntu tries to present the maintance of the operating system in a windows-like way to enable windows users to operate a unix-alike-os. Using a shell is something these users cannot perform. Besides, it's not like you popped out of the womb fully versed in the use of UNIX. Like an extremely intelligent friend once said with an amused shrug: "really smart people don't talk about how inferior others might seem." 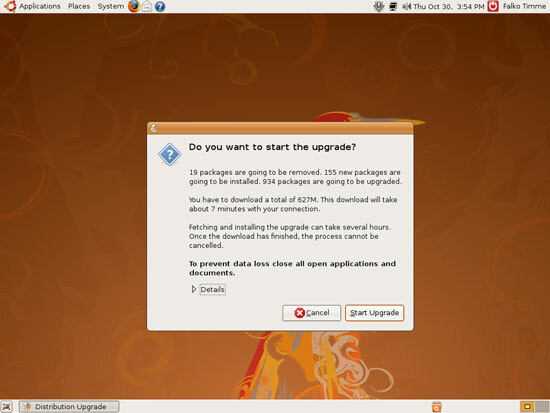 I've always upgraded my five Ubuntu machines using the upgrader and never once had a problem. The people who do have problems are usually those who enable all sorts of oddball repositories and install unsupported hacks like Automatix. It's disingenuous to tell people that the only way to upgrade Ubuntu is by wiping their hard drive and starting over from scratch, Windows-style. At the very least, the updater should be tried first and if it results in badness, then wipe your disk and start all over. 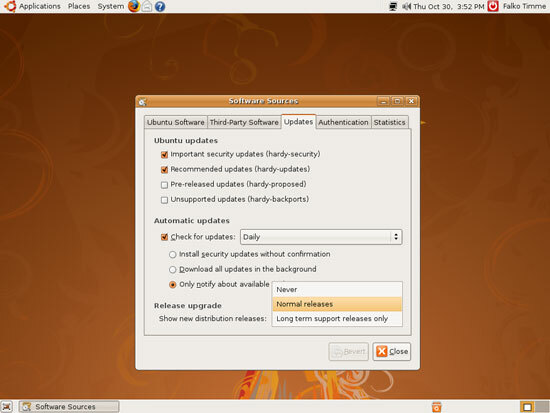 If Ubuntu is based on Debian, can't you just edit your /etc/apt/sources.list to comment the third party sources and replace 'hardy' for 'intrepid', and then run "sudo apt-get update" and "sudo apt-get dist-upgrade"? That's the method that I've to use this time, because LiveCD block and don't run. Using a shell is the best way for me, also. The graphic interface is good too but it´s a matter of preference. 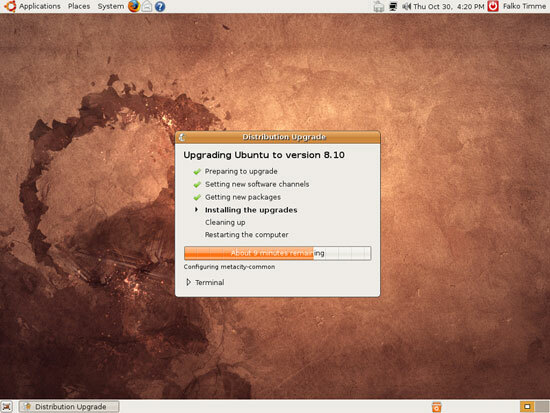 I have been using Ubuntu since Ubuntu 5.04 was released and have never had an upgrade work. I don't install anything outside of the official repos and I use the recommended upgrade methods. The last upgrade (Hardy to Intrepid) left me with a mostly unusable system - APT and xorg would no longer work. 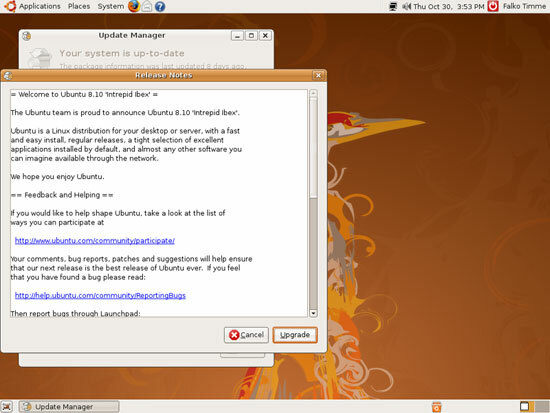 Ubuntu is one of the best distros on the planet, in my opinion, but the safest way to upgrade to the next release is to do a fresh install from the latest livecd because there is no way of knowing which system will survive any other way of upgrading. I've seen far too many people in the irc channel having problems with the recommended upgrade methods. I just recently upgraded with this method. I am not having any problems running the system. However, I can tell you, for me, it took forever. It wanted to download a couple of thousand packages. Apparently, it wanted to re-download and re-install everything I had installed, with the exception of some packages it decided to remove. So I think the next time I upgrade, I'm just going to do a fresh install. 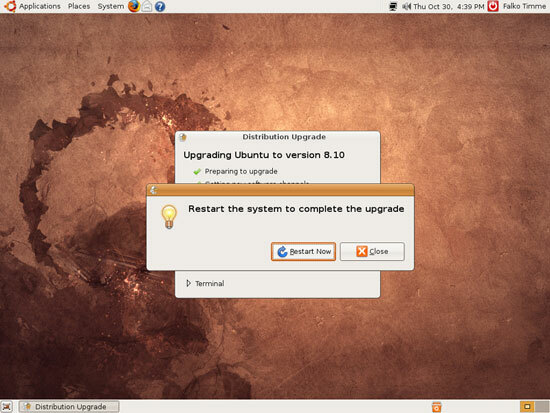 Upgrading within the current instalation is easier and faster but I´m not sure it´s the more reliable way of doing it. I use to have a little partition for fresh installs for testing before definitive installation. I don´t know if using a virtual machine could be a reliable test. Anyway, it´s odd to use windows-style of solving problems with Linux. The idea is to have the freedom to fix the problems and be able to get help from people around the world. I was running 8.04 and upgraded through the normal prcedure. After the restart I have no desktop. I was using the KDE desktop. When I try to use /etc/init.d/kdm start is comes back and states no file or directory. HELP!!!!! Dude, read the big yellow box right above your comment! yes - if you look carefully, the upgrade to Intrepid will TRY to do some really sneaky and (IMO) TERRIBLE things to your Ubuntu - like REMOVE KDE! seriously DO NOT just go ahead and do a fully automated "let me take care of everything for you" Mac/Windows style upgrade! -and really, who the hell in their right mind would WANT to anyway? what the hell are they thinking? For some unknown reason, after following the release upgrade settings steps and upgrading everything I could using update-manager (I'm really a shell junkie, but I thought I'd do it by the book to make sure it goes smoothly), I still wasn't getting the release upgrade. 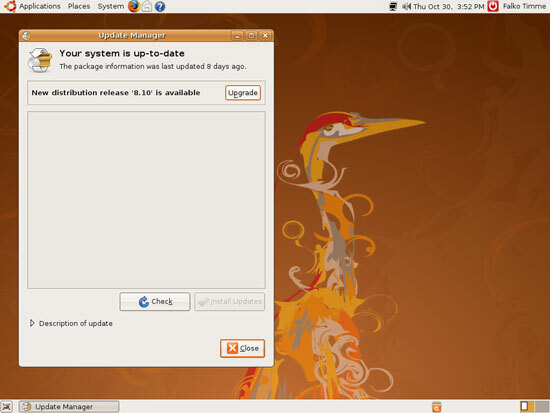 OK, I've been using Ubuntu since the beginning of 7.04. The first thing i needed to find and do was get a hold of some sort of free backup utility. I found and since (always use) partimage system res cd. 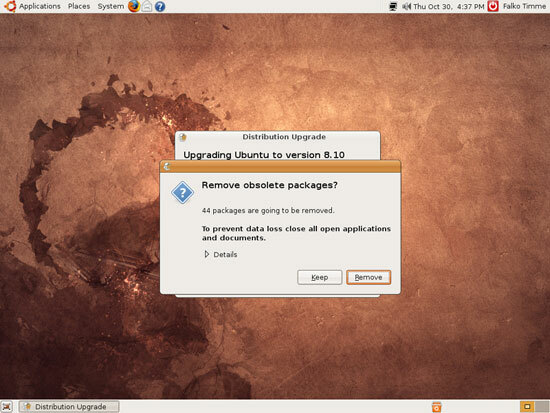 Before doing (any) upgrade I make a mirror image of my partition running ubuntu. This way if something goes wrong or i don't like something i just restore right back to were i was before the upgrade or my own screw up. Let me tell you i've had to do it! not for the upgrades but learning linux and making changes and screwing things up. I run ubuntu full time on 2 dell desktops and one dell laptop. I never had any problems with the upgrade method. I just updated 2 days ago from gusty to 8.04 and everything was again routine. But i still have the full mirror image of gusty saved on another partition on the hard drive just in case. Case in point what i will do now is take those files of gusty and put them on DVD then zero that partition and then use partimage to save the mirror image of 8.04 upgrade to 8.10. Its that simple. A very nice insurance policy. Partimage is very simple to use once you learn how it works. Tip: always use partimage off the live cd never never use it while running linux at the same time. Yes on http://www.sourceslist.eu I've found hundreds of useful repositories! for me ingalex sources.list is the best!